Ninja. What does it mean? If you know me in real life or follow me on twitter you know I utter the word “Ninja” a lot and tell folks “wow you have major kung fu.” You’ve probably thought what does she mean by ninjas and all of this kung fu talk. The answers are simple and will leave you harnessing your inner ninja. 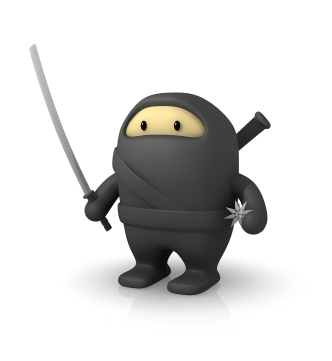 A Ninja is someone who puts the needs of others before their own. It is someone who reaches out when no one else will, someone who will stand up for those who cannot, and remains a voice of reason. Ninjas know when to hold em and when to fold em. They also, especially the ninjas who went to college in Wisconsin know how to throw down. Thrown downs happen often and are usually followed by giggle fests. Mostly your ninja is a tiny person (it’s so true) that lives in side of you. The ninja waits quietly for those moments when you can’t go on. That ninja signals your brain, and says “Go Ninja go.” It takes over and gives you the strength to be, to live, and to conquer this world without question. Sometimes you may yell “To Wanda” when conquering the world and other times you move with stealth speed. Either way your inner ninja uses his/her kung fu to do everything that you feel you cannot do. It never steers you wrong and always always listens to your heart. Ninjas usually travel in packs. Sometimes they are found alone and are caught doing good deeds. When this happens we shout “Wow that’s some major kung fu you have there.” Kung fu is not a method of destruction, but more as a method of construction. Ninjas use their kung fu fighting powers to bust through their days, love their families, and make our world better. Whether it be through volunteering our time with children, building houses, raising money, or using our ninja smarts to find a cure. We are always Kung Fu Fightin! So the next time you see a ninja don’t fret, just yell “hey you kung fu fighting ninja you!” If you do this they well erupt with giggles, giggles are contagious, hence the term giggle fest. A ninjas main goal in life is to bring love, laughter, and hope to where ever they may travel.